BC's beautiful Okanagan Valley produces some of the world’s finest stone. Each year, we quarry and ship thousands of tons of stone to customers nationwide. After quarrying, we invest considerable labour, carefully grading and palletizing our inventory of stone in order to ensure that you are receiving consistent quality from project-to-project. Achieve your specific style requirements is best communicated with a good photo for your mason. Kettle Valley Stone’s Natural ’Thin Stone Veneer’ can be installed in less than half the time as full stone; because of its light weight & thinner profile, Thin Stone Veneer can be used in applications that would normally require the use of full stone. Order Kettle Valley Granite now to boost your home’s curb appeal! If you have been searching for that certain something to set your yard apart from others, then search no further! Kettle Valley Stone Company has a wide variety of stone products perfect for the weekend warrior, or the professional landscaper. Kettle Valley Stone Company has various colours and textures of stone products available in a variety of sizes from HAND size stones to MAN size boulders. We also carry landscape crush in chip, one inch and two inch sizes; all of these are perfect for complementing your new rock retaining wall, and/or acting as a decorative accent in your garden beds. Start your landscape project now! Contact Kettle Valley Stone Company to order your product needs today! Designers know it as TSV. 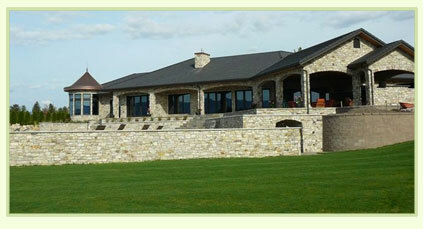 The primary advantage of Thin Stone Veneer (TSV) is that it starts from the ground up. Thin Stone Veneer is basically a facing product that doesn't require a ledger, footings or wall ties like a full-sized stone. Veneer Stone does not need support footings underneath its structure supported by any footings underneath as it is supported by the wall. Overall project savings when using a Natural thin veneer are hidden in reduced structure or building costs, a lower freight component and higher installation or productivity rates on your project. Stone may be added at the last minute without much additional preparation. Within the parameters of a large project and from an engineering standpoint, these are significant savings, as they relate to structural reinforcement. Thin Stone Veneer may be used to surface chimneys, dormers, and higher elevations that can't carry a heavy load. This process reflects cost savings for the overall project. Without having to carry a structural component all the way up, the resulting labour costs are significantly less with TSV: it goes up faster and easier than full-sized stone, because it is lighter. Putting up more square footage, without the structural issues associated with full size stone or brick, also means less stress on the mason working that day!